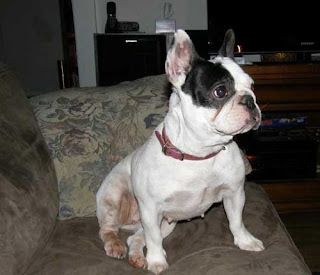 "By Jiminy, Cricket is ready to find her forever home! Cricket was surrendered by her owners when her grudge with their other dog just couldn’t be resolved, and they no longer had the time to manage the situation. She was also demonstrating symptoms of severe anxiety, and her woners knew they needed to get her some help. This was Cricket’s second home already, after she had been rescued from a puppy mill-type situation, so she is more than ready for some stability and a family to call hers for the rest of her life." Thanks for spreading the word about Cricket...hope she finds her furever home soon. Cricket is a fun looking guy! Poor Cricket! I bet she is scared and confused! I hope she finds an understanding and loving forever home very soon! Oh, Cricket..I hope you soon find the PERFECT family and home where you can just be who you are! 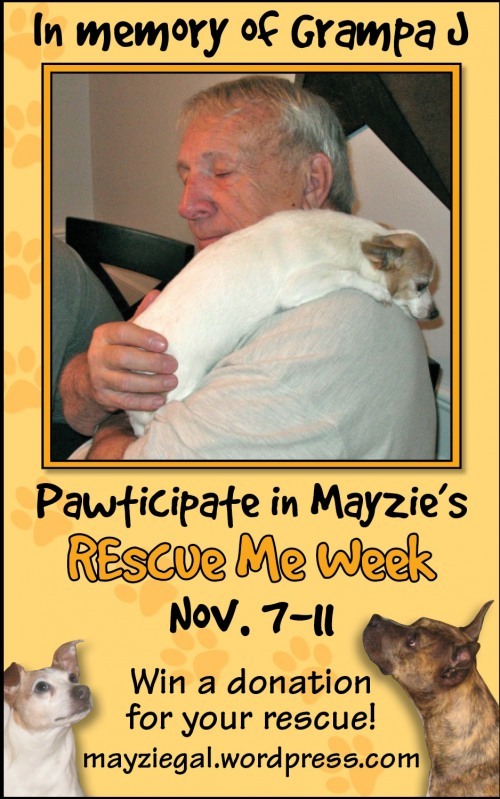 What a cutie... paws crossed that Cricket goes home soon. She is too cute. 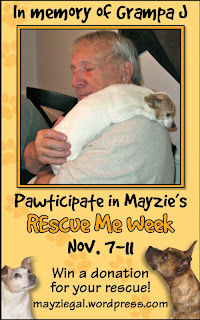 and I"m really liking Mayzie's rescue series! Pawscrossed for a new forever home soon! I just know that Cricket will find her loving furever home real soon. I thinks she needs to be an only pup! Cricket deserves a good home, Mom and me is really hopin' dat her gets one soon. Cricket Deserves a good home... and IF your MOM sees your Duck Tape thingy... tomorrow on my blog... you two just might also.. I'm just SAYIN.. Keep Your MOM AWAY from my Blog tomorrow... fur your own sakes. WHEW are you two ever BRAVE!!!! Poor Cricket. I hope she finds a good home soon...she deserves another chance. Criket just wants some attention of very own, right? Who can blame her :) We hope she finds a wonderful furever home soon that will give her nothing but love and attention! Thanks for the heads up...what a sweetheart!!! Cricket sure is a cutie!! We have had a hard time getting around to visi with Mom's big ouchie. But we think you are doing a great thing for Cricket - amazing how much support Mayzie has from Blogville. Mom is really a pug person, but she said Cricket is really cute. And if she lived closer and didn't have two pugs she would cuddle her right up. Oh, Cricket, you sure are taking the scenic route to your Most Perfect Home That Ever Was, huh? Well, that's okay...that's what happens sometimes. But my paws are crossed that your next home is THE one! Hope Cricket soon finds the family that she is meant to live with for the rest of her life! Aw Cricket is darling! I hope she finds the most pawfect furever home very very soon! Awwwww.... sweet lil' Cricket~ I hope she finds a wonderful forever home!